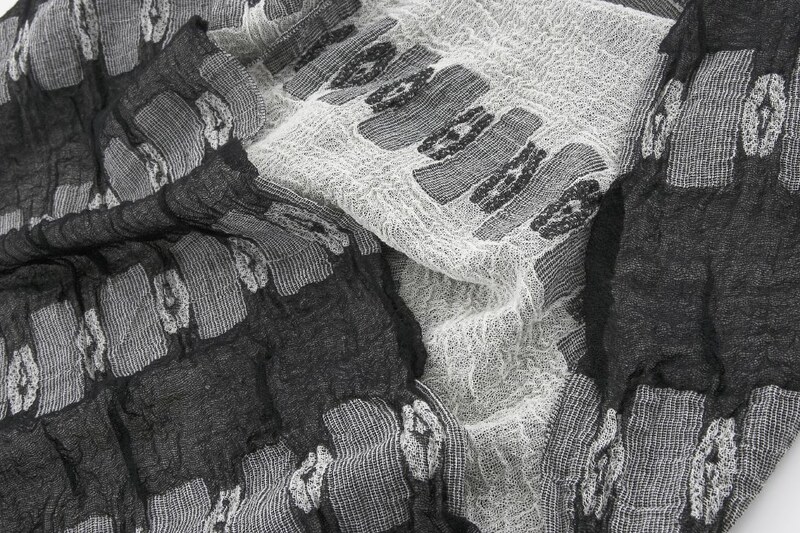 Acclaimed internationally for innovative and complex woven textiles, Jennifer Robertson uses a unique purpose built digital handloom and her works span a broad range of textile practice-led research outcomes including sculptural relief and miniature 3D artworks, interior and fashion. Thematic research projects focus on exploring relationship between environment, science, human form, interior space and materiality through the use of weaving metaphors and analogies. Investigating the poetic and evocative nature of materials interplay using soft engineering, threads are constructed into often innovative multiple layered structures imbued with sensorial characteristics. Jennifer has collaborated with international textile industry with special woven textile production outcomes and recently with earth science research to realize sculptural woven 3D geological artworks using new materials – basalt, carbon, glass, stainless steel, copper, silver and polyester. She works independently in her studio on thematic research projects with outcomes such as woven design prototypes; innovative woven 2D and sculptural relief 3D artworks; miniature textile 3D artworks; and limited edition production – fashion/smart textiles such as sensorial, luminescent wraps, scarves, fashion – and comfort/performance interior textiles, including upholstery and furnishings. Research interests include creative technical materials, soft engineering and design innovation, sensorial comfort and sustainable fashion. Jennifer Robertson lives and works in Canberra, Australia. 2003/06 Jacquard Design Certificates, Fondazione Lisio, Florence, Italy. 1987 Established Weave Studio, Australia. 1984-5 Post Graduate Studies in Woven Textiles, Royal College of Art, London, UK. 1981-4 BA Hons Degree in Woven Textiles, West Surrey College of Art and Design, Farnham, Surrey, UK. 2017 VCCAFS talk, Australian National University Art Forum, Canberra, Australia. 2016 Lecture, Southern Highlands Fibre Textile Network, Sturt Craft Centre, Mittagong, NSW, Australia. 2016 Invited Speaker, 11th International Biennial Contemporary Textile Conference, Kherson, Ukraine. 2013 present Lecturer, Course Convenor, Foundation Studies, School of Art, RSHA, CASS, Australian National University, Canberra, ACT, Australia. 2009 Lecture, Kyoto Seika University, Kyoto, Japan. 2009 Lecture, Kawashima Textile School, Kyoto, Japan. 2009 Lecture, Sheridan College of Art and Design, Toronto, Canada. 2009 Speaker, “Inspired Design, Entrepreneurial Jacquard Textiles”, Center for Craft, Creativity and Design, North Carolina, USA. 08,06,05,03 Residencies, Fondazione Arte della Seta Lisio, Florence, Italy. 1997 – 2011 Lecturer, Textiles, School of Art, Australian National University, Canberra. 2005 Acting Head, Textiles, Australian National University. 2005 Member Craft Australia Export Advisory Group. 2000 Presentation of work to her Majesty Queen Elizabeth II on behalf of ACT Government. 1999 Executive Committee member, “Shikat” project, Philippines. 1999 Textile Network ACT committee member. 1998 Exhibition Coordinator, “Folding”, Legislative Assembly, Canberra. 1997 Speaker and invited Lecturer, Canberra Spinners and Weavers Guild, Canberra. 1994 Lecturer, Textiles, Edith Cowan University, Perth, WA. 1993 Invited Judge, City of Perth Craft Award, Perth, WA. 1991-2 Lecturer, Textiles, Edith Cowan University, Perth, WA. 1988 Lecturer, Summer School, Albany, WA. 1987-96 Established Studio, Royal George Arts Centre, Fremantle, WA. 2019 Solo Exhibition, CSIRO, Canberra, ACT, Australia. 2018 Contextile, International Contemporary Textile Art Biennial, Guimarez, Portugal. 2018 Placemakers, Craft ACT, Canberra, Australia. 2018 Fibre and Clay, Narek Gallery, Bermagui, NSW, Australia. 2018 VCAFS Survey Exhibition, Australian National University SoA&D Gallery, Canberra, Australia. 2018 Scythia, 12th International Biennial Contemporary Textile Art, Ivano – Frankivs’k, Ukraine. 2017 Design Canberra Festival, Six Degrees of Separation, Graphic Installation at Canberra Centre, Canberra, ACT, Pop up Living Room, Narrabundah, ACT. 2017 CraftACT Members Exhibition, CraftACT, Canberra, ACT. 2017 Woven Mineral Artwork, permanent display, ANU Research School of Earth Science, Canberra, ACT. 2017 “Miniartextil”, International Finalist, Como, Italy, touring Europe until end 2018. 2017 Wangaratta Contemporary Textile Award, Wangaratta Art Gallery, Victoria. 2017 The Gift Project, Marmara University, Kadikoy, Istanbul, Turkey. 2017 The 8th International Biennial Exhibition of Contemporary Mini Textile Art “Scythia”, Kherson/Ivano Frankivs’k, Ukraine. 2016 “Petite”, National finalist, Textile Minatures, Wangaratta Art Gallery, Wangaratta, Victoria. 2016 International exhibitor, “Embracing Innovation”, CraftACT, Canberra, ACT. 2016 International Finalist “11th International Biennial Contemporary Textile Art Exhibition, Kherson, Ukraine. 2015 “UnEnFolding”, Solo exhibition, Gallery Gallery, Kyoto, Japan, Nov/Dec2015. 2015 National Finalist, biennial Wangaratta Contemporary Textile Award, Wangaratta, Victoria, Australia. 2014-15 National Finalist “Bespoke”, Museum of Australian Democracy, Old Parliament House, Canberra, ACT. 2014 “Small Works” Beaver Galleries, Canberra, ACT. 2014 “Petite”, National Finalist, Miniature Textiles, Wangaratta Art Gallery, Wangaratta, Victoria. 2012 Jennifer Robertson @ Santa Fe Weaving Gallery, Santa Fe, NM, USA. 2011 “Elements Fibre”, Celebrating 100 years Canberra, CraftACT, Canberra, ACT, Australia. 2011 National Finalist, “1st Tamworth Textile Triennial, Tamworth Regional Gallery and touring nationally until 2013. 2011 National Finalist, “Wangaratta Contemporary Textile Award” Wangaratta Art Gallery, Wangaratta, Victoria. 2010-11 “Of Light and Air” solo exhibition, Narek Galleries, Tanja, NSW. 2010 National finalist, “Petite Miniature Textiles” Wangaratta Exhibitions Gallery, Victoria. 2010 “Weaving Air” solo exhibition, Beaver Galleries, Canberra. 2009-10 “Bravura” Art Gallery of South Australia. 2009 Wangaratta Contemporary Textile Award, Wangaratta Exhibitions Gallery, Wangaratta, Victoria. 2009 “Transitions”, National Wool Museum, Geelong, Vic. 2009 “Art Work” ANU SoA Gallery, ANU, Canberra, ACT. 2008-09 “Inspired Design, Entrepreneurial Jacquard Textiles”, Center for Craft, Creativity and Design, North Carolina, USA, touring until end of 2009. 2008-9 “40 Highlights from the Ararat Regional Art Gallery”, Victoria. 2008 “Botanicals” Object Gallery for Contemporary Craft and Design, Sydney. 2008 “Freestyle” Design Triennale Museum, Milan, Italy. 2007 Co-curated “lightweight?” Textile exchange exhibitions held at Dunedin Polytechnic, New Zealand and ANU Foyer Gallery, Canberra. 2007 “Smartworks”, Powerhouse Museum, Sydney. 2006 “Freestyle” Object and Melbourne Museum travelling until 2008. 2005 “Confluent” with Christopher Robertson, Narek Gallery, Tanja, NSW, and Ararat Regional Gallery, Victoria. 2005 “Visions from the South”, Textiles and Ceramics from ANU and USQ double exchange exhibition. Co-curated with Greg Daly, ANU. 2005 “Design-ed” Australian National University, School of Art Gallery, Canberra. 2004/5 “Miniartextil”, International Miniature Textiles, Como, Italy, Nule, Sardinia and Montrouge, France. 2004 City of Hobart Art Prize, Tasmanian Museum and Art Gallery, Hobart, Tasmania. 2004 “Tripleweave”, Solo exhibition, Craft ACT, Montreal Centre for Contemporary Textiles, Canada and focus at Livingstone Studio, London, UK. 2002 “From Canberra to Kyoto”, Kyoto Seika University, Japan. 2002 “City of Perth National Craft Award”, Perth, WA. 2002 “Australian Craft”, Mokkumto Gallery, Seoul, Sth Korea. 2001-2 “Floral Emblems of Australia”, Australian National Botanic Gardens, Canberra. 2001 “City of Perth National Craft Award”, Perth, WA. 2001 “Divergence”, Siam Centre, Bangkok and Chang Mai University, Thailand. 2001 “Double Portion”, Solo exhibition, Craft ACT, Canberra and Craftwest, Perth, WA. 2001 “20th National Craft Acquisition Award”, MAGNT, Darwin, NT. 2000-2 “Frisson”, 14th Tamworth Fibre Textile Biennial, national tour. 2000-1 “Loom”, Artlounge Gallery, Adelaide, SA and Craft Victoria, Melbourne. 2000 “Woolly Mantle”, Solo exhibition, Brisbane City Gallery, Brisbane, Qld. 2000 “In Our Hands”, International Miniatures, Nagoya, Japan. 2000 “Domestic Design”, Craft ACT, Canberra. 2000 “Miniatures”, Gallery Gallery, Kyoto, Japan. 2000 “Folding”, Itami Art and Craft Museum, Hyogo pref, Japan. 1999 Beaver Galleries Christmas Show, Canberra. 1999 “Touching the Landscape”, joint exhibition, Australian National Botanic Gardens,Canberra. 1998-9 “Folding”, Dowse Museum, New Zealand and Legislative Assembly, Canberra. 1999 “25th Alice Craft Acquisition Award”, Alice Springs, NT. 1997 University of Woollongong, NSW. 1997 5th International Textile Competition, Kyoto, Japan. 1997 Foyer Gallery, Craft ACT, Canberra. 1997 17th National Craft Acquisition Award, MAGNT, Darwin, NT. 1996 “Gestaltendes Handewerk”, Munich, Germany. 1996 “The Language of Thread”, Art Gallery of Western Australia. 1996 “Folding”, Artshouse Gallery, Perth, WA. 1995 “Vic Health Craft Award”, National Gallery of Victoria. 1995 “Directions”, Contemporary Cloth, Craft ACT, Canberra. 1995 “Woolworks”, Moora, WA and National Wool Museum, Geelong, Victoria. 1994 Hyatt Hotel Foyer Gallery, Surabaja, Java, Indonesia. 1994 4th International Textile Competition, Kyoto, Japan. 1993 “Wanneroo Craft Award”, Perth, WA. 1993 “York Art and Craft Award”, York, WA. 1993 Perth Waldorf Craft Award, Perth, WA. 1992 “Textiles and Praxis”, Craftwest, Perth, WA. 1991 “City of Perth Craft Award”, Craftwest, Perth, WA. 1991 “Are You Sitting Comfortably?”, Jamfactory, Adelaide, SA. 1990 “City of Perth Craft Award”, Craftwest, Perth, WA. 1990 “Woolcraft Awards”, Moora, WA. 1989 “Commissions for the King”, joint exhibition, Craftwest, WA. 1989 “City of Perth Craft Award”, Craftwest, Perth, WA. 1988 “Woolcraft Awards”, Moora, WA. 1984 Seven Dials Gallery, London, UK. 2016 Individual Project Grant, Australia Council for the Arts. 2011 New Work grant, Visual Arts Crafts, Australia Council. 2009 Decree of Excellence, International Biographical Centre, UK. 2009 Award for Best Transformations of Colour, National Wool Museum, Geelong, Victoria. 2005 Export Market Entry Grant, Business ACT, Canberra. 2004 2005 1 year Creative Arts Fellowship, artsACT. 2004 Canberra Critics Circle Award. 2004 Howard Nye Outstanding Award for Hand Weaving, CraftVIc, Melbourne, Victoria. 2004 Australia Council / CraftACT Craft-In-Site grant. 2004 CAPO General Project Grant. 2003 ArtsACT Project funding, residency at Fondazione Lisio, Firenze, Italy. 2001-3 Australia Council Visual Arts Crafts 2 year Fellowship, VACF, Australia Council. 2001 Canberra Critics Circle Award. 2001 artsACT Quick Response Grant, travel, solo exhibition, Craftwest, Perth, WA. 1999 CAPO General Project Grant. 1998 NS Grant, Australian National University, Canberra. 1996 Project Grant, New Work, Visual Arts Crafts Fund, Australia Council. 1995 WA Department for the Arts, Conferences/Seminars Grant. 1994 Visual Arts Crafts Fund, Australia Council, International Promotions Grant, Japan. 1994 Visual Arts Crafts Fund, Australia Council, Project Development Grant. 1993 Award for Excellence, Perth Waldorf Craft Award, Perth, WA. 1993 Award for Excellence, Wanneroo Craft Award, Perth, WA. 1993 WA Department for the Arts, Conferences/Seminars Grant. 1993 Craftsman of the Year Award, York Art and Craft Award, Perth, WA. 1991 “Prize for Excellence”, City of Perth Craft Award, Perth, WA. 1990 “Prize for Excellence”, City of Perth Craft Award, Perth, WA. 1989 “Highly Commended”, City of Perth Craft award, Perth, WA. 1988 Australian Merino Society Award, Woolcraft Awards, Perth, WA. 1983 “Commendation”, Royal Society of Arts Bursary Competition, London, UK. 2005-6 Velvet Jacquard Prototype Commission, Historic Houses Trust, Government House, Sydney. 2000 Renwick Alliance, Smithsonian Institute, Washington DC, USA. 1998 Private commission, Seoul, South Korea. 1991 Joint furniture private commission, Perth, Western Australia. 1988 Major Fibre Optic Commission, Museum of Science and Technology, Perth, WA. Museum and Art Galleries of the Northern Territory. Ararat Regional Art Gallery, Ararat, Victoria. Renwick Alliance Collectors, Smithsonian Institute, Washington DC, USA. Cleveland Museum Collectors, Ohio, USA. Oakland Museum Collectors, Oakland, California, USA. Canada, Finland, Germany, Hong Kong, India, Indonesia, Italy, Japan, Korea, Singapore, Switzerland, United Kingdom, USA. National – ACT, Queensland, New South Wales, Northern Territory, South Australia, Tasmania, Victoria, Western Australia. 2014-15 Short run studio trial double cloth production run. 2013-14 Development prototype textile designs for production by Australian Mills. 2005-6 Historic Houses Trust, NSW Government House Sydney, Jacquard Velvet Prototype Commission, Italy. 2006 Silk production, collaboration between Bianchi company, Como, Italy and Fondazione Lisio, Florence, Italy. 2001 Double cloth manufactured by NUNO Corporation, Tokyo, Japan. 2010 Canberra Times, weaving air. 2008 “Inspired Design” Center for Craft, Creativity and Design, NC, USA. 2007 “Smartworks”, Design and the Handmade, Powerhouse Museum, Sydney. 2007 Who’s Who of Australian Women. 2006 “Freestyle” Thames and Hudson,UK. 2005 Selvedge magazine, UK May/June issue. 2005 “Two Shades of Excellence”,Sunday Times, Oct16th. 2004 “Collect”, Victoria and Albert Museum, London, UK. 2004 “Object” magazine, no 44 p 25. 2002 ABC “Stateline” Television programme, September 13th 2002. 2002 ABC national television programme, “Coast to Coast”, May 19th 2002. 2002 Front Cover, Craft ACT Exhibition programme. 2001 “Double Portion”, David Bromfield, West Australian Newspaper. 2001 ABC television “Snapshot” programme, April. 2001 Articles “Craft Bulletin” magazine, Craft Victoria, volumes 1 and 2, 2001. 2001 Articles, Canberra Times newspaper, March and April. 2001 Front cover, USA “FIBERARTS” promotional brochure. 2000-1 USA “FIBERARTS” magazine, major article and front cover, Dec/Jan. 2000 “Loom”, Front cover, catalogue and article. 2000 Article, “Object” magazine, no 4-00, p89. 2000 “Craft Arts International”, “Frisson” article, October 2000. 2000 “Canberra Chronicle”, front page, March 28th. 1999 Craft ACT “Profile”, Nov/Dec. 1999 “Muse”, Floriade article, September. 1997 “Masters of Their Craft”, Noris Ioannou, Craftsman House. 1997 “Nouvel Objet II”, Design House Publications, Seoul, Sth Korea. 1995 “Textile Fibre Forum”, magazine, Profile, winter 1995. 1994 Craftwest, “Profile”, Crafts Council of Western Australia. 1994 Video production for SBS television. 1994 ABC television educational programme. 1994 “West Australian Weekend” magazine, Jan 29th. 1991 “International Crafts”, Martina Margetts, Thames and Hudson. 1989 “Interior, Architecture and Design”, Issue 21, YPMA Sydney. 1989 “Modern Australian Furniture”, Michael Bogle, Craftsman Press. Hello Jennifer, I was student of yours many years ago. I finished Art School in the year 1998. My name is Kate Carter, hoping you might remember me. I have looked at your work and its very inspiring . I am very busy with my kids at the moment but would love to get back to my textile work, aswell I was wondering if you would be kind enough to give me the information about the type of stainless steel you use and where I could purchase it from. Really looking forward in hearing from you. With kind regards from Kate Carter. Hi Kate it’s really lovely to hear from you! I am using stainless steel from China- purchased through Ali baba and it’s around 1.5-1.8 mm gauge, soft. Hope you are well and enjoying beautiful children !